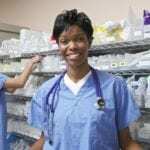 Clinical training is critical to your success as a Certified Nurse Aide. It is also a mandatory part of CNA classes in most states, comprising of 16 to 100 hours of the total training. 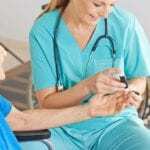 The training at a long term care center or other approved facility provides the outlet for nurse aide students to put their conceptual knowledge into practice. Students work directly under the supervision of a Registered Nurse instructor and sometimes get the opportunity to shadow Certified Nurse Aides during the training. Without this opportunity to provide direct care in a real-world environment, you won’t have the training required to pass the skills component of your state’s nurse aide competency evaluation. Apart from providing the environment for hands-on learning, clinical experience should reinforce patient safety and comfort, the importance of infection control and respect for patients’ rights. The 1987 Nursing Home Reform Act mandates that all prospective CNAs receive a minimum of 75 hours of classroom and clinical training. Federal regulations require training programs to include a minimum 16 hours of clinical “hands-on” experience as part a of the training. More than half the states designed CNA training programs that exceed the minimum federal training requirements, reflecting the state boards’ belief that students require more training to meet the complexities of providing direct care. Therefore, it’s possible that your clinical training could cover as much as 100 hours in your state. Criminal background checks: The training provider will initiate the background check prior to the first day of classes in order to receive the results before the clinical training begins. Felony convictions could disqualify you from nurse aide training. Drug screening: Along with the background check, the nursing home and school will require a ten-panel drug screen. Immunization records: You’ll need to provide a copy of your immunization records. Note: If you don’t have all the appropriate immunizations, you should start early as it can take up to six months to complete a series of immunizations. Some of the shots you’ll need are Rubella/ Measles (MMR), Varicella (Chickenpox), Hepatitis B Series, Tdap (Tetanus, diphtheria, pertussis). CPR Card: Your CPR training must be one designed specifically for the Healthcare Provider or Professional. The certification must be valid throughout the entire clinical practicum. TB Test: The PPD screening is a two-step process that you’ll need to complete before the clinical practicum. Liability insurance: Normally purchased as a group. Physical exam: A report showing you’re in good physical and mental health. Supplies: In order to maintain a professional appearance while on the “job,” you’ll need to wear scrubs and closed toed shoes (rubber soles). You’ll also need to purchase a watch with a second hand, stethoscope, gait belt and blood pressure cuff. The training facilitates hands-on interactions with patients. You need to be mentally prepared for the job as you’ll encounter residents with varying degrees of disability depending on where you work. For instance, some patients may have off-putting ailments. Others may have mental illnesses or disfiguring conditions. If you train at a hospice, you might have to work with patients who are nearing death. Sadly, no amount of mental preparation will leave you unaffected by the sight and scent of the patients at many long term care facilities. Fortunately, your training and compassion will help you to shake off the sadness (and/or repulsion) of the environment, so you can provide the best care possible. During your first week, the RN instruction will either assign you to a team or a CNA to shadow. After demonstrating the basic skills during the first week, the instructor will assign you to a patient or two where you’ll practice basic tasks like infection control, making beds and feeding the patients. Later on, you’ll have the opportunity to practice patient transfers and bathing patients. One common complaint among 90 percent of nurse aide students is the revelation that CNAs in the training facilities use shortcuts instead of following the prescribed steps. Note, in real-world scenarios, the CNAs have to care for several patients at once. As a trainee, you must follow the prescribed procedures in preparation for the skills exam where shortcuts are not acceptable. One crucial aspect of the clinical experience is to prepare for the skills component of the state exam. Use the opportunity to practice all the skills that the exam requires – there might be 21 to 30 skills depending on your state’s curriculum. While you can practice during the labs or review videos online, the real-world environment is the best place to gain experience. Clinical practicum takes you into the actual health care setting where you’ll practice your skills with helpful guidance from your instructors. You’ll also have the chance to meet a network of health care professionals including Registered Nurses, Licensed Practical Nurses, and other Certified Nursing Assistants. While the training is not a social time, it will present opportunities to meet peers and learn more about nursing and your future goals. Use the time wisely to learn all you can, and remember, 100 percent attendance to clinical training is critical to your success.